Openreach were working on the telephone pole over the road from my house earlier today (which I am connected to) as well as circuits in the ground. My problem is that my internet speed has lost about 12/13Mbps since the work (at 4Mbps right now). On the phone you can hear static in the background. 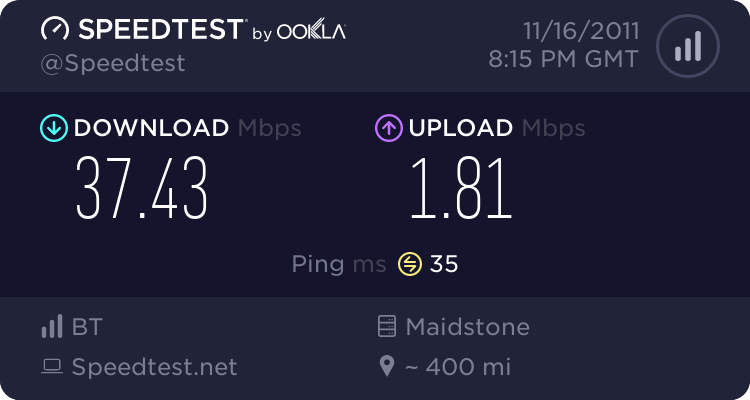 My ISP is sky but they are unable to do anything till OR complete there work when they return on Friday (so I'm told). Does anyone think there is any possible way an engineer might be able to look at the line and see what the problem is? This issue is affecting both my Internet and phone calls. When picking the phone up the internet even drops out completely and re-syncs. I suspect that there is either a problem with where the cable is connected into the end of the pole or where the engineer was working in the ground. Calling BT to report the problem is no good the india call center is useless. The noise margin is jumping all over the place, even more so if I call someone. Sky's line test showed no problems with the line they could detect. Noticed no one wrote to you but now have. So phone line makes noices, internet rubbish (polite way of saying). Just like me some time ago. Ringing up monkeys in India, don't get me started. They do a line test and ok, What part of internet is low sync and crackles on the line so can hardly hear the person. Works and does not but always does when ringing india (so hard work!). Start getting firm but not nasty and insist someone comes around and looks, say you guess there is a nick in the cable, duff join or some cable fault. Record the line playing up if it means rinning up a friend and speeking rubbish. Do you have a recorder feature on mobile phone, what I did using speaker phone so nice loud noise to record. Then got some ammo. I had the underground, not 5cm under the soil and patio of next door cable from a BT jointer box in the ground, cable bearly underground to a grey junction box to out 4 flats our end of the building. This had gone so phone playing up and guess noise on it so internet profile dropped. No problem sir,, [censored] when you ring up the keyboard pressing script monkeys. Dont take no for an answer. BT openreach arrive with their toys and it even says where along the wire the problem is and was right. under next doors patio that some slabs where removed. will be a problem and get openreach along and someone in this country who knows what they are doing will sort it with their toys. India useless but will get an appointment for you. When mine multiway cable to the flats was repaired still not convinced and got the incoming wire from the grey box outside neighbours wall up my wall into the roof and mastersocket (we are upstairs single flooor flat ) replaced and all ok, Keep moaning and get them back until it works. Use BT line test on the quite line option 17070 option 2. Record it wrong, I did but never used as no email to send audio clip on. Woul;d have when gave up with india and moved onto higher up in UK. Where people know what is what. Not against india, Just useless BT monkeys. On the phone you can hear static in the background. Report it as a phone issue to whoever you pay your line rental to; they are responsible for it. first do a Quiet Line Test on 17070 Opt 2 with router disconnected,. I like the other suggestions, I read somewhere always report as a voice fault and did all the tests before moaning and they would get me to do all off this as we are all stupid and don't know what to do. Move the router to the test socket hidden behind the removable plate on the main incoming master socket. Does it still play up. When front plate is removed extensions go so then use a normal wired phone on the test socket and see if it crackles. Try a new broadband filter on the test socket with the 2 things plugged in. Process of elimination you get to prove it is not your stuff or extension wiring. If openreach come and is not the master socket back ( their wiring ), then you pay for the visit and some daft cost. Was told this when I demanded someone come and look at the line, Read about the tests on BT web site and maybe made a few up. Obvious need to make sure it is not your stuff. When sure then ring and don't take no for an answer, "It is working". not if slow and phone crackles. Might be worth getting a neighbours wired phone so you make sure it is not yours playing up. I used Mum and Dads 5 minutes walk away. They where left with the cordless so ok!. Is your line rental with BT or with Sky on LLU? The reason I ask is that BT Retail, i.e. any support line you have access to in any country, have nothing whatsoever to do with your broadband, and secondly if your line rental is with Sky they have nothing to do with that either. Line rental is with BT yes. Broadband is Sky LLU - I have spoken to them the only thing they could do is start investigating after BT OR have finished there work when they return on Friday. I plan to speak to the OR engineer soon as they start arriving tomorrow morning. If it isn't right afterwards, your first step is as the others have said above. See if there is noise on the line with just (a cordless corded preferably) phone plugged into the test socket. (As per the BT Phone Book instructions). If there is, just report a (voice) fault to BT, and do not mention broadband to them. The odds are fixing audible noise will also fix broadband noise, and it's much simpler to achieve. Edit - should have said "corded", as now, rather than cordless!